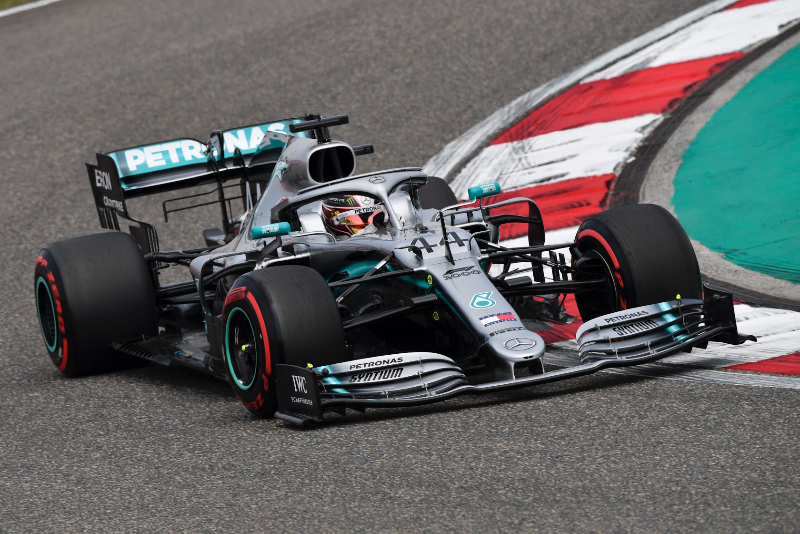 After taking the lead into the first corner, Lewis Hamilton won the Chinese Grand Prix in Shanghai, in his Mercedes GP, 6.552 seconds ahead of his team mate Valtteri Bottas, with Sebastian Vettel in the Ferrari in third, 13.744s behind the winner. Mercedes has now won the first three races of the season, taking three one-two finishes. It is Hamilton's second win in a row, and 75th win of his career, and has now lead greater than 4,000 career laps. Hamilton takes over the lead from Bottas in the drivers championship. The Chinese Grand Prix marked the 1,000 Formula One race since the modern championship began in 1950. 107 different drivers have won in F1 since then. Max Verstappen (27.627s) in the Red Bull-Honda finished in fourth, Charles Leclerc (31.276s) in the Ferrari was fifth, Pierre Gasly (1m29.307s) in the second Red Bull was sixth, Daniel Ricciardo (1 lap) in the Renault was seventh, Sergio Perez in the Racing Point-Mercedes was eighth, Kimi Raikkonen in the Alfa Romeo-Ferrari was ninth and Alex Albon (after crashing in practice 3) finished in his Toro Rosso-Honda in tenth to take the final point. Before the start Bottas starts on pole, Hamilton, Vettel and Leclerc behind. The first five runners are on medium tyres, places six through ten on soft tyres. There is a 40% chance of rain during the race. On the formation Verstappen spins but rejoins his position. The lights went off and Bottas got a slow start and Hamilton leads him into the first corner, Leclerc beating Vettel into third. On the first lap at turn 6 Kvyat, in the same incident, hits both McLaren's of Norris and Sainz. Both McLaren's pit for damage and the virtual safety car comes out. On lap 2 the track goes back green with Hamilton leading Bottas, Leclerc, Vettel, Verstappen, Gasly, Ricciardo, Perez, Hulkenberg and Grosjean in tenth. Giovinazzi, after starting in 19th, is up to 15th. On lap 6 Albon passes Giovinazzi for 15th. Kvyat, in 14th, is handed a drive-through penalty for causing a collision. On lap 7 Leclerc locks up into the hairpin, and Vettel closes up on his young team mate. On lap 8 Giovinazzi pits and switches to medium tyres. Kvyat serves his stop-go penalty. Ferrari tells Leclerc to push. Ferrari makes the call and tells Leclerc to let Vettel by, and he does so. At lap 10 Hamilton leads Bottas by 2.9 seconds, followed by Vettel (7.5s), Leclerc (8.7s), Verstappen (11.4s), Gasly (19.4s), Ricciardo (26.2s), Perez (28.3s), Raikkonen (31.4s) and Stroll (42.5s) in tenth. Hulkenberg pits for hard tyres and runs last. Vettel locks up, but continues. Leclerc states his frustration to the Ferrari team and says, "I'm losing a lot of time." On lap 14 leads Bottas by 4.5 seconds. On lap 17 Hulkenberg pits and Renault retires the car. On lap 18 Verstappen pits from fifth switching to hard tyres and he rejoins seventh behind Perez, who he duly passes for sixth. On lap 19 Vettel pits from third for hard tyres and rejoins in fifth ahead of Verstappen. Ricciardo pits for hard tyres. On lap 20 Verstappen tries to pass Vettel for fourth, the two battle side-by-side but Vettel hold the position. On lap 21 Bottas pits from second for a quick stop for hard tyres and rejoins in third, ahead of Vettel. The next lap leader Hamilton pits for hard tyres, and rejoins still in the lead. Leclerc pits from second as well and takes hard tyres and rejoins in fifth. On lap 23 Bottas sets fast lap at 1m36.690s, and then again the next lap at 1m36.558s. At lap 25 Hamilton leads Bottas by 1.5 seconds, followed by Vettel (9.2s), Verstappen (12.8s), Leclerc (22.5s), Gasly (31.9s), Ricciardo (54.1s), Perez (56.9s), Grosjean (60.1s) and Magnussen (67.3s). Raikkonen pits for hard tyres. Omn lap 27 Raikkonen passes Magnussen for tenth place. On lap 28 Stroll passes Giovinazzi for 13th place. On lap 29 Raikkonen battles with Grosjean and takes ninth place. On lap 31 Giovinazzi and Kvyat both pit, Kvyat for a new nose. Stroll is reporting to the team that he is having gearbox issues and is having harsh downshifts. On lap 34 Hamilton asks who has fastest lap, and the team tells him it is Bottas. On lap 34 Verstappen pits for a second time from fourth for medium tyres and rejoins in fifth place. The next lap Ferrari calls Vettel in to cover Verstappen's stop for medium tyres and rejoins in fourth behind Leclerc and ahead of Verstappen. On lap 43 Toro Rosso retires Kvyat in the pits. Raikkonen closes on Perez in eighth place. Stroll pits and takes on soft tyres and rejoins in 13th. At lap 50 Hamilton leads Bottas by 7.0 seconds, followed by Vettel (12.0s), Verstappen (23.1s), Leclerc (33.5s), Gasly (61.6s), Ricciardo (86.4s), Perez (88.5s), Raikkonen (91.4s) and Albon (1 lap) in tenth place. Hamilton asks what the fastest lap time is, and is told 1m34.8s. Leclerc tells Ferrari that he is having a problem with his gears. Norris retires in the pitlane. On lap 53 Gasly pits from sixth place for soft tyres and rejoins still in sixth - perhaps looking to take fast lap. On lap 56 Gasly takes fastest lap at 1m34.742s. At the chequered flag, Hamilton takes the win over Bottas and Vettel. On the podium Hamilton said, "It's not been the most straight forward of weekends, but what a fantastic result for the team. ", Bottas said, "I lost it at the start. ", and Vettel said, "They were too quick, right from the start."